Viral animals come and go, but the laughs stay for a lifetime. Media feeds are dedicated to finding and sharing the quirkiest of animals with the world, understanding the needs of the human race to see them. We connect with them on a subconscious level, knowing on the inside we are all the same. Each viral animal has its own personal MBTI, just like we do. Their personality aligns with a specific set of traits which translate over to the human realm of beings. You might be surprised by the results, kicking yourself for never noticing how similar you are to such a viral sensation. Read on to find out which viral animal matches your MBTI! ISTP's are spontaneous and unpredictable like the chubby rat stuck in this manhole in Germany. This rat probably tried to squeeze through the hole on a whim, instead of weighing the consequences of his actions. You have to give him credit for his enthusiasm to get himself halfway through. He is probably the mysterious rat of his mischief, always doing things no one expected and leaving behind not a single explanation. His facial expression says enough about how he thinks this project went and it is doubtful he will try it again until he loses a few pounds. The Magic Kingdom Candy Squirrel created quite a stir with his masterplan to steal the candy bar, but he acted like a true INTJ. He needed to know what was inside the beautiful yellow bag sitting by the counter, so he devised a plan to take it. His ambition drove him to success but also outcasted him from the squirrel community. The other squirrels did not understand why he had to know about the candy bags, content with their petty squandering of scraps. Candy Squirrel's need for knowledge set him apart, despite his ideas to improve upon their way of life. ENFP's hate living in a box, or in this case trapped behind a fence. 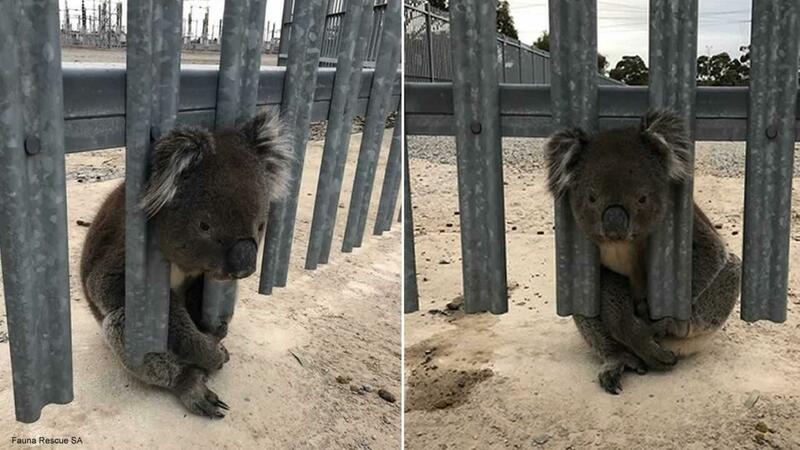 This Koala ended up with his head stuck in the fence as he tried to find a way through to the other side. This isn't the first time this Koala has been in trouble, having previously been struck by a car in an attempt to cross a busy street. He might not always get it right, but his methods are methodical and planned, despite the failure of his intuition. It doesn't slow this koala down as he continues on the path to finding his true self and the deeper meaning to life. Goose the Cat is the epitome of an ENTJ. Goose is a born leader and a visionary who inspired an entire legion of cats to join up and fight the cause. Goose's dominant personality has driven others to want to be like her as people from all over the world are pasting their animal's faces in place of Goose. She saw the talent in the world and her movie poster sent out the call for aid. Thanos won't stand a chance against her viral animal army, functioning as a team with Goose at the helm. INTP's, like Pizza Rat, pride themselves on their ingenuity. He discovered the best method of stealing a piece of pizza. He found that grabbing the corner of the slice, rather then the middle is the key to a successful getaway. He had tried numerous times before to obtain the legendary slice but recognized a pattern in his continued failure. Pizza Rat's daydreams were filled with slices of pizza, and the countless flavors he still needs to sample for himself. He even came up with some samples he was sure no one had heard of before, like a dumpster dive marinara topped with moldy cheese. Samples that one day Pizza Rat might bring into being. ESTJ's are moral gurus, like Mayor Goat. Mayor Goat promotes personal values and works in the community to bring people together. He organizes events for charity and is a part of numerous boards committed to the people of his small town in Vermont. He believes his example will drive people to reform as he strives to be a model citizen of the community. He understands that he is only one goat and he needs the strength of others to help him achieve his goal. INFJ's are opinionated and passionate, like Pigcasso. He was supposed to be sent to the slaughterhouse, but he changed his narrative the day he picked up a paintbrush. He is an advocate for pigs' rights everywhere, his artwork an interpretation of how he views the pig-eating community. He feels for the pigs who don't make it, his brethren in arms, each death a stab to his emotional heart. Pigcasso imagines a world where pigs can run free and be safe from the stomachs of their captors as he works to paint that world into reality. The bunny who thinks he is a sheep is an ISFP at heart. He works to push the boundaries of social norms as he shows the world that bunnies and sheep can work together. This bunny reinvented his image as he proclaimed himself part sheep in a global fashion. This bunny found harmony with the sheep, becoming who he wants to be in a world of judgemental creatures. He was criticized and praised for his bold ambition, but his focus on the positive kept him going, despite his short temper. This dog who adopted a possum is a defender of the weak like the ISFJ. She lost her litter, but instead of focusing on the tragedy, she turned it into a success story. She gave the gift of life to the possum, taking it onto her back like the mother she is. She doesn't enjoy the spotlight, seeing her actions as nothing special, but her kind nature makes it impossible for her to tell the news crew to go away. She understands she might not be the best mother for the possum, but it won't stop her from trying. ESFJ's are popular like the bedazzled pigeon. People gravitated towards her multitude of sequins as they worked to find her when she had gone missing. She loves the spotlight, allowing herself to be found so she could be on camera. She is the ring-leader of her group, coming up with plans and ideas for their next grand social outing. The bedazzled pigeon probably went missing after she attended a wild party with her other pigeon friends. There were rumors someone trashed her reputation amidst the fun, leaving her so upset she refused to show her face at home. The outpouring of support from the media helped her regain her confidence and she is the most popular pigeon on the block once again.